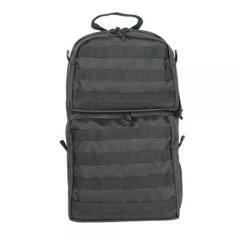 Stay hydrated and performing at peak levels with The Merced Hydration Pack from Voodoo Tactical. Lightweight enough for all day carry, but large enough for versatile storage, the hydration pack is the ultimate travel companion. Designed for versatility, the Merced features two rear pouches that offer optimal storage space for a lunch, flashlight, poncho and other day-hike essentials. Seven rows of universal webbing offer a multitude of attachment points for additional pouches, holster carriers and other MOLLE-compatible accessories. The hydration system employs both right and left side hose exits as well as elastic securement for total system customization. A padded back and shoulder straps disperse the pack's weight for a balanced and comfortable feel.